Shop Summit Online online at SummitOnline.com for all your Inline Skates, Roller & Quad Skates, Aggressive Skates, Roller Hockey Skates, Skateboards, sports clothing for the whole family, hockey gear, outdoor gear, ski gear, snowboarding gear and so much more. Summit Online carries all the name brands you've come to love such as Vans, Twelve, Wave Sport, Type A, Teva, Toko, The Fun Company, Travel Chair, Winnwell, Symbol, Solstice, Spacecraft and many more. 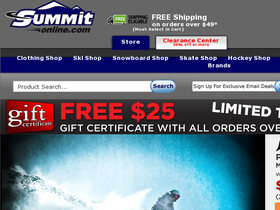 Save on your next purchase from SummitOnline.com with Summit Online discounts, Summit Online coupons, Summit Online promotions and Summit Online savings from 58coupons.com. Enjoy free shipping from SummitOnline.com on orders over $99 or more. Click link to start shopping. Head on over to Summit Online and save up to 60% or more on clearance items. Click link to start saving. Get a free Rollerblade Diva Skate Backpack (valued at $50) with the purchase of any 2010 Woman's Rollerblade brand Inline Skates over $180 from Summit Online. Receive a free Pro-Tec Ace Skate SXP Helmet (valued at $45) with the purchase of any 2010 Aggressive Skates over $199 from SummitOnline.com.